For some bizarre reason I tend to set ridiculous sewing goals before its time to leave for a holiday. Because what says “get ready for a week to relax” like spending two weeks trying to sew up five new wardrobe pieces? Gah! So when we made a last minute decision to head to Vanuatu for a ninja holiday I vowed to sew nothing in preparation to really maximise my laziness relaxation. Then I realised the perfect pattern and fabric for a rad resort dress lived in my stash and who was I to deny this rule breaking frock? This is Simplicity 8178 – a cross-over bodice that can party as a romper or as a frock. View A is a wide legged jumpsuit, View B is the narrow legged option and I made up View C which has a gathered knee length skirt. And if that isn’t enough you also get a bonus jacket as View D! That’s what I’m calling a bargain – especially as a I snaffled this in a 3 for $10 sale. Construction wise, this was a nice and quick win. I cut the fabric just before a CBR Sewing Crew session and had it finished in four hours except for the elastic (and that included eating copious amounts of popcorn and Bec’s amazing biscuits). I did accidentally sew the front wrap pieces on back to front at one point due to be being sugar high but that was totally on me and not the instructions. Note to self – stop at two biscuits when sewing. The only alteration I made was to shorten the waistband elastic – the original size was just a bit too loose and it felt like I was wearing a potato sack. So I turned that sad (potato) sack into a glad (potato) sack with the application of shaping to waist! Huzzah! It’s also worth noting that the wrap top is pretty low cut so depending on your circumstances you may want to either stitch the end of the wrap further around, tack it down or live the sassy neckline dream. I went with the sassy option but y’all know I like to live life on the edge 😛 This may change when I start wearing this out of a holiday setting but until then – sassy life! How quick and easy it was. This was the perfect pre-holiday outfit! Pockets! Enough said there, really. Fabric: mystery poly from a mystery store in Santiago. So much mystery! Overall, I seriously love this frock and wore it a bunch on my holiday in Vanuatu but sadly it has been hanging in my wardrobe until things warm up here. Someone send some warm weather Canberra way because this lady need to wear her holiday frock with some sun and a coconut cocktail STAT! So pretty! Love the mystery fabric. You should definitely make the jumpsuit. 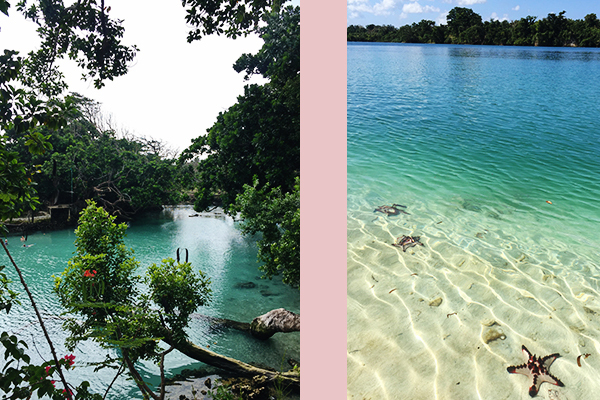 Vanuatu looks beautiful too, hope you had a great time! perfect dress for a beach holiday – looks great on you. You are bang on the money – I’m so glad the fabric didn’t make it out the door (due to my laziness, but still!) I can’t wait to wear this frock some more! This is such.a cute dress. I did buy that pattern for rhe jumper but I am looking at the dress now. How lovely is the bodice design, Vicky?! I feel like we both need the jumpsuit AND the dress! Wow what a great pattern. Did you find that at Spotty? I have a jumpsuit that I bought from Uniqlo that is identical to the line drawing. I love it so it would be great if I could sew my own version up. Another pattern to add to my ‘need’ list! Yup, grabbed the pattern at one of those great 3 for $10 Spotlight sales! Go grab this pattern, Charlotte! It is seriously fabulous and I am going to have a bash at the jumpsuit as well – it is so good! love this!! perfect fabric for the pattern. beautiful! Great fashionable look. Can be dressed up or casual. For my sewing sisters … I have an over abundance of beautiful fabric such as what is shown. I am trying to unload it. I was doing a lot of sewing and I believe that I am in a new season of my life. If anyone is in the West Palm beach area and do a lot of sewing, please let me know you will be blessed. I also have a mccall sewing file cabinet full of various simplicity, butterick, McCall and other patterns mostly size 20-22. I am a fashionista!!! It’s fabulous! Definitely make the jumpsuit! The tapered leg version is similar to one I made but in a black viscose knit and it truly makes me feel like a chic ninja! I say make it in a nice drapey solid colour and you’ll wonder how you did without it! This is fabulous, and I’m loving the mystery fabric! Thanks, Mel! Not going to lie – it was freezing getting these photos and I may have had a cheeky wine when I got back inside. I see hope though – we hit 20 degrees one day this week. Yahoo!!!! Wow! You are seriously churning out some awesome pieces!! This would be pretty rad with your chambray shirt unbuttoned over it and some fun tights/boots! Break the rules and bring that baby out of the closet (so to speak). Love the print on you! Dreaming of sewing one day..when I’m done unpacking. Thanks, Heather! I have a bit of a back log 😀 Good luck with the unpacking – I do not envy you! Cute dress – perfect for a getaway! Also, the jumper… I have been looking for a jumper pattern, and that is a really nice looking jumper! We should all make it! Thank you!!! And good jumper patterns are treasures to be hoarded!